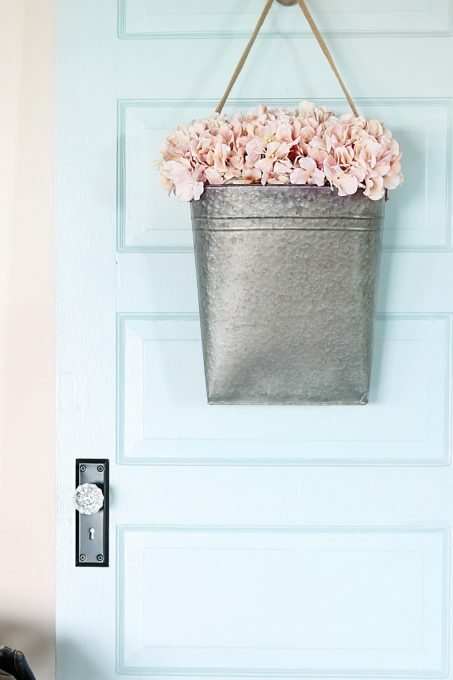 Ready to give your space a boost with a fresh new paint color? 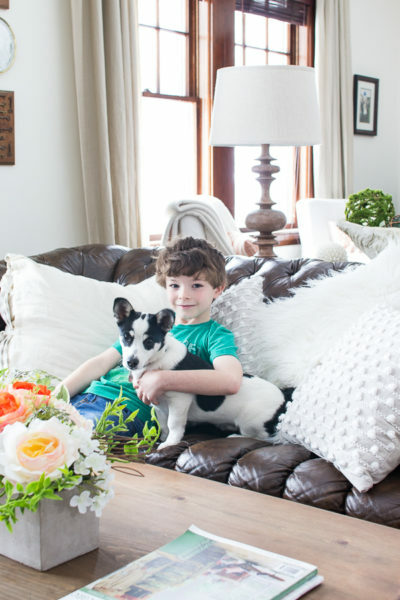 Get inspired by these favorite paint colors from top home bloggers! Hello everyone! 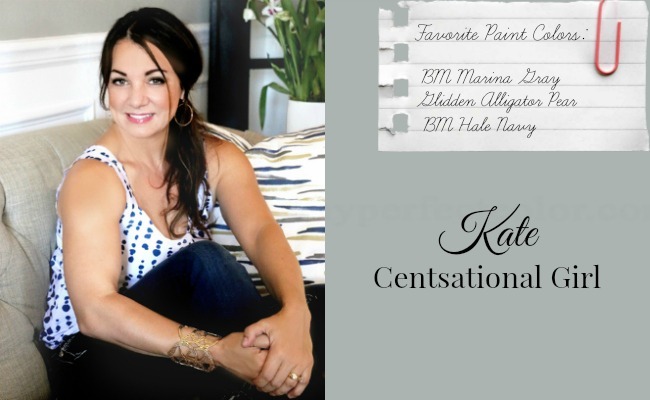 Today I’m excited to finally be sharing an updated version of my ever so popular paint colors series. Have a space or two in need of an update? 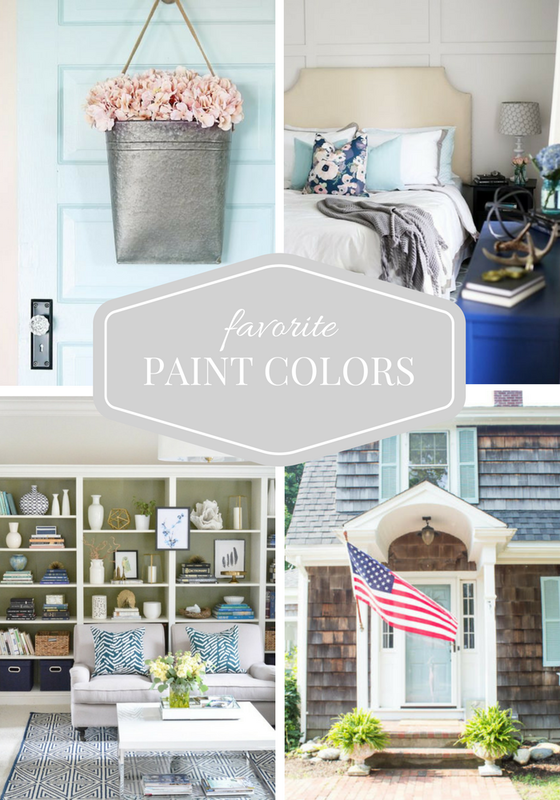 Get ready to jot down some beautiful paint color picks from some of my favorite home bloggers. At one time or another, we’ve all had tiny paint swatches taped to our walls agonizing over a final decision. Does that one look pink? I think that one’s too dark? Maybe I should just play it safe and go beige? It’s definitely tricky at times. Thank you so much Shauna for inviting me to share a few favorites! 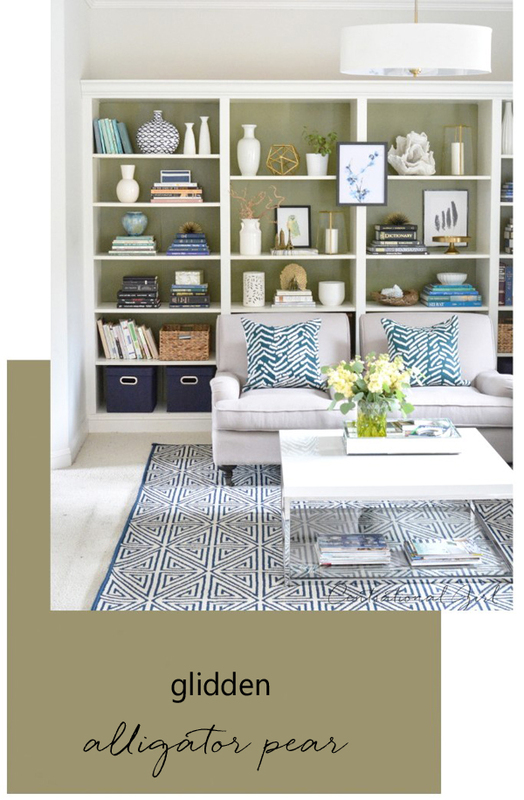 I’m an avid lover of blues and greens, they are the hues I use so much in decorating. Darker versions add depth and drama, paler or less saturated blues and greens are always soothing in any space. 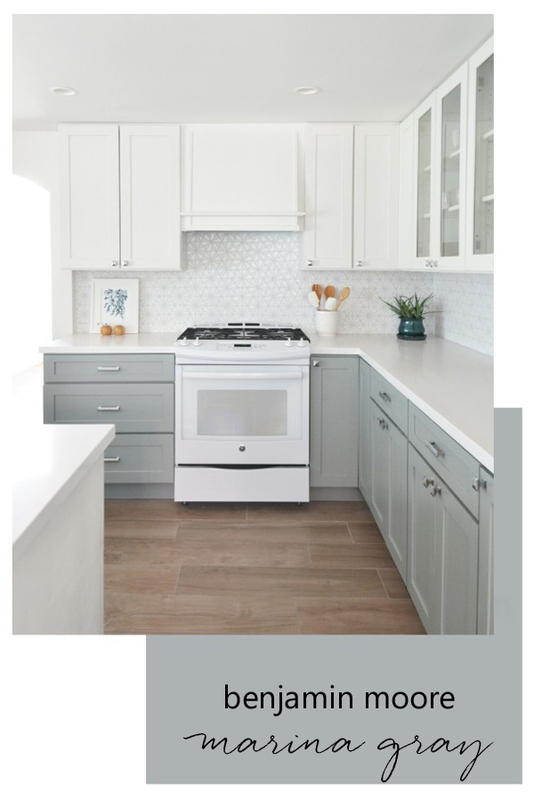 In a recent kitchen remodel I chose a pale gray blue for the lower cabinets and was delighted with the outcome paired with white cabinetry above. I color matched the company’s cabinet color with Benjamin Moore Marina Gray, also added to the backs of the glass front cabinets to tie them together. This is such a soothing blue gray hue! Greenery was announced as Pantone’s Color of the Year, it’s nice to see green placed in the spotlight. I added a lovely olive green to the backs of the built in bookcases in my guest studio called Alligator Pear by Glidden and still love the look! Lastly, I partnered with a friend to redo her powder room. 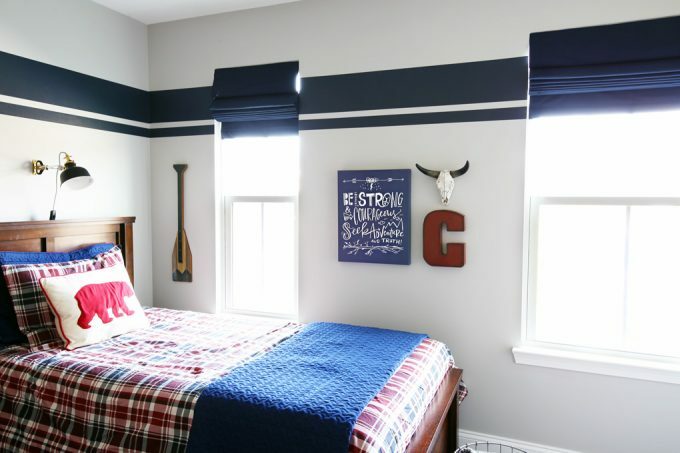 This small space was great spot to add sophisticated deep blue. 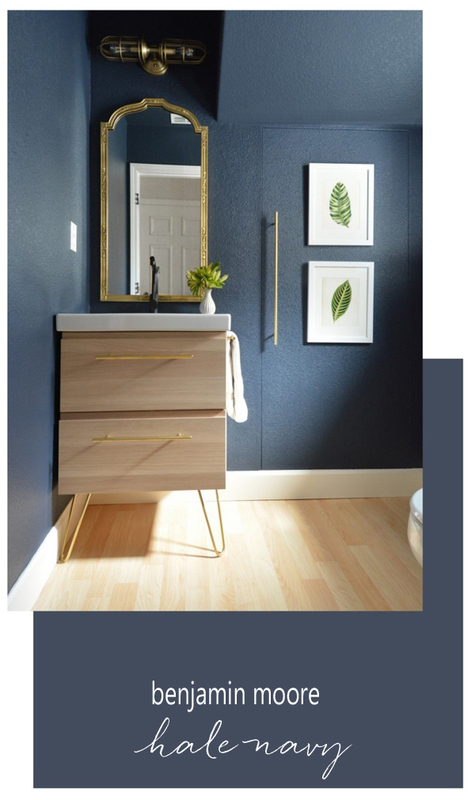 Benjamin Moore’s Hale Navy adds drama to this freshened bathroom space. Hey there, sweet readers! 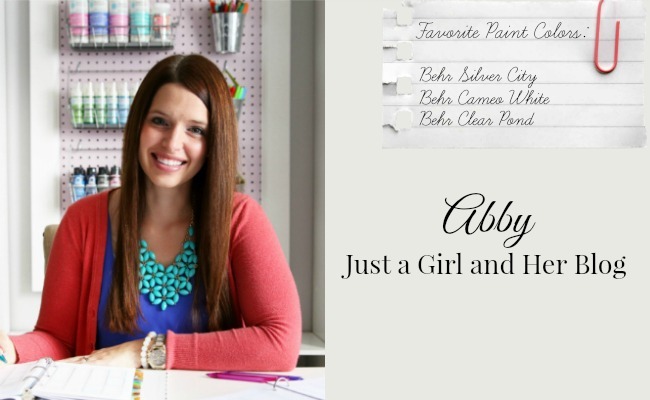 I’m Abby from Just a Girl and Her Blog, and I’m delighted to be participating in Shauna’s favorite paint colors series today! I also have a favorite go-to white that I use in many different spaces. 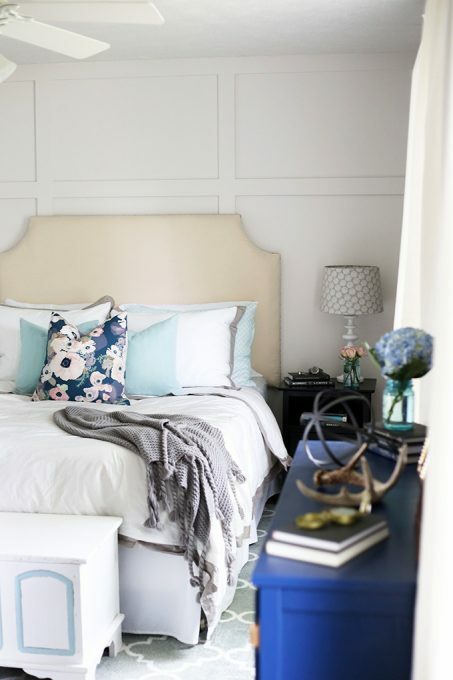 (It may sound funny to have a favorite shade of white, but there really are so many, and the slightest variance in undertone can give the space a different look!) My very favorite white is Behr Marquee Cameo White. 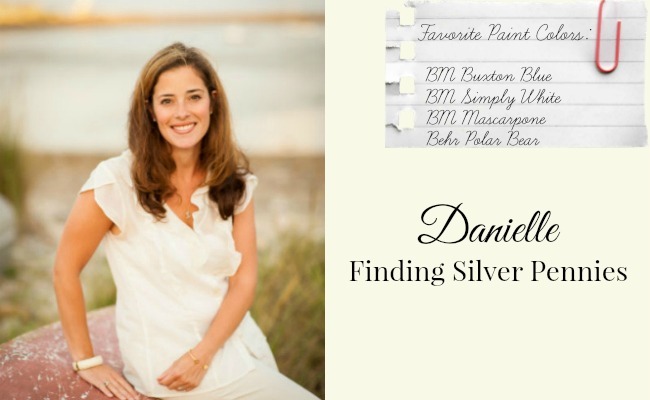 Hi Everyone, my name is Danielle and I blog over at Finding Silver Pennies. We live a hop, skip and a jump from the sea in New England. Our town is quaint and our home is a classic Dutch colonial with cedar shingles. My design, decorating and color choices are very much influenced by the sea and the relaxed vibe of coastal living! 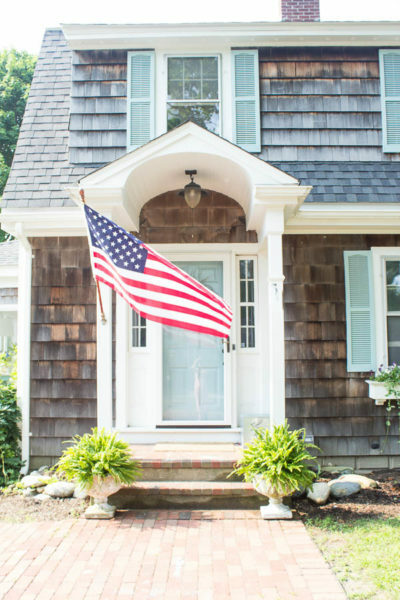 I get asked too many times to count about our front door and shutters. When we first moved into our home the door was a butter yellow and the shutters were black. These colors just aren’t me. My favorite colors are blue, gray, a few tans and lots of white. I knew that the door and shutters had to be blue. It took me some time but I finally decided on Benjamin Moore’s Buxton Blue . It’s the happiest shade of blue and looks so great against weathered shingles. I decided to go with high gloss for extra drama. Painting the doors and shutters was done soon after we moved in 4 years ago and I still get asked about the color today! 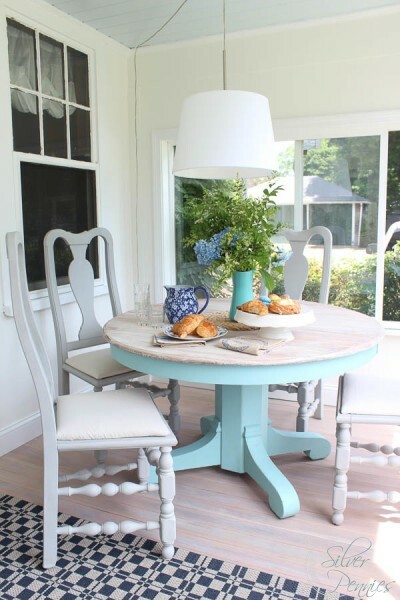 Our old house has dark woodwork, to make our dining room and living room brighter I used Benjamin Moore’s Mascarpone. It is a creamy white that makes the dark woodwork look rich and appealing. It’s soft and sophisticated and always makes me smile. I also used this color in my boys’ bedroom. We did a makeover last year when we also took their ceiling and a faux wall between their room down (old houses, huh?). 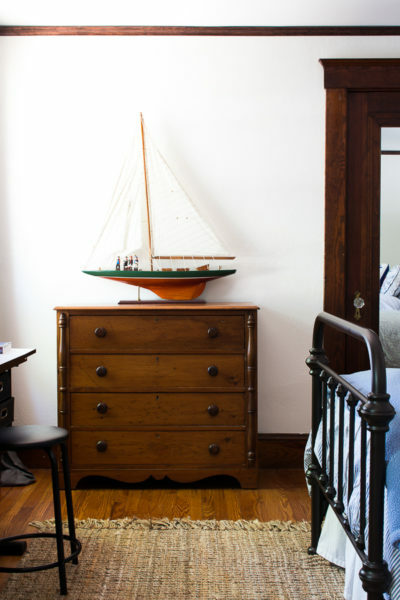 We created a fun workspace and a complete nautical bedroom for them. 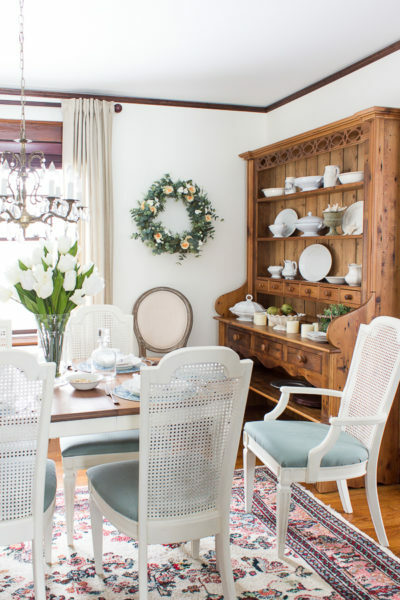 In a room with antiques and modern furniture it gives a classic, old school look. 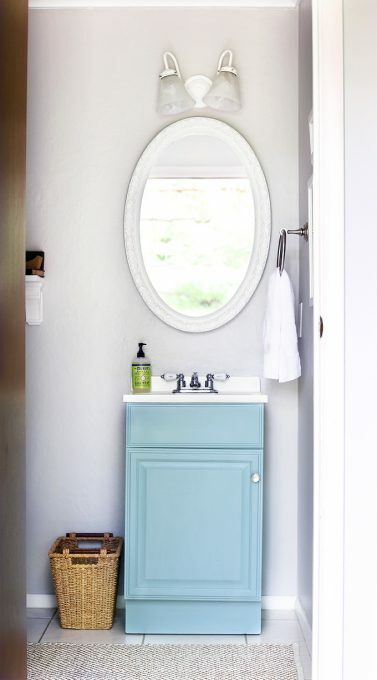 This color also pairs so nicely with dark woodwork. The last paint color I want to share is out in my She Shed, funnily enough it is also white. Hmmm, you might be seeing a trend here. This is Polar Bear by Behr. We completely made over this shed to be a coastal oasis in our backyard away from the sometimes chaotic energy inside our home. 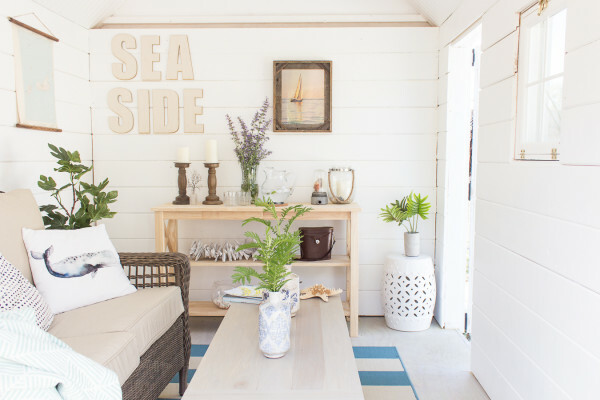 This shed is filled with DIYs including the coffee table, the shiplap walls and the nautical chart wall hangings. Polar Bear white is the perfect white for shiplap. It is crisp, bright and light. It evokes a calm atmosphere. I’m so excited to be able to us this space once again now the warm weather is coming! 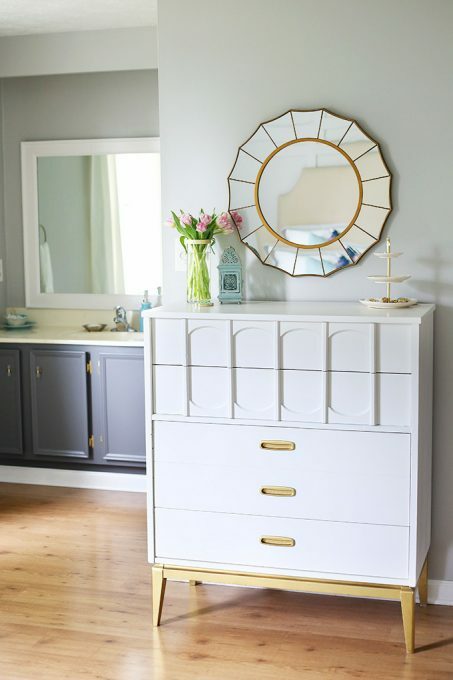 Pin these Top Paint Color Picks for Later! So, there you have it for today. Beautiful spaces, right? I would be happy spending time in every single one of them! A she shed? That sounds amazing! Be sure to come back tomorrow for PART TWO of this series featuring more top paint color picks. It’s an exciting line up of bloggers with more gorgeous inspiration, I promise! Update: Go HERE to see Part Two. All the rooms are very nice. Wonderful colors all of them! Thank you Shauna for including me among these talented ladies! Thank you for sharing your beautiful color inspiration!